1. I spent almost $1,000 on books just for this semester. (And I still have a couple more to buy.) 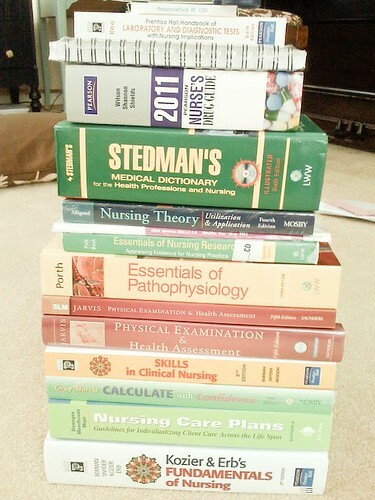 They assure me I'll use these books for more than 5 months, so it's ok, but wow. Just wow. 2. Whenever I hear Fink come on Pandora, I'm transported back to Chicago on a chilly, overcast day. It makes my heart smile. 3. When I walked into my first nursing class yesterday, I was the only student wearing patterned scrubs. I didn't exactly enjoy standing out (especially on the first day), but also didn't mind looking a little more cheery. 4. My dear old camera decided it wasn't going to work today. I'm talking really nicely to it even now, praying it will come back to me! 5. Watching skills videos for nursing school is a little awkward, especially when it's showing you how to bathe a patient and the patient in the video looks like she's about to crack up laughing the entire video! Homework has suddenly become hilarious. 6. Planners are one of my favorite invention ever. 7. It's my Mom's birthday today! We celebrated at Shogun and the food and the celebrating were both delicious. That is a lotta books! I am so proud you wore your patterned scrubs!!! Happy Birthday to your sweet Momma! Give her a hug from me! They are putting a Lou's in the old Anthro store. Break my heart. They couldn't even pick a good pizza place to put in it! Ummmm, your camera not working...so not ok.
Talk to the upperclassmen and find out what books they REALLY use. Purchase those, and then consider renting your other ones from chegg.com. Don't worry about your patterned scrubs. I'm sure you looked adorable!